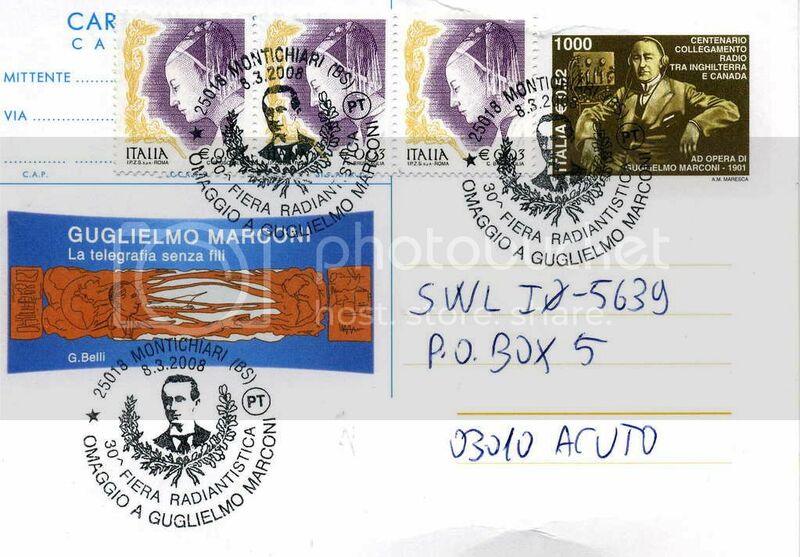 with Guglielmo Marconi from the 30th radio exposure of Montichiari (BS). > Dutch 333 June 8 YL and OM with comments. > 333 June 8 Two OMs with Sports updates. Mackenzie-CA. > 444 June 8 Two OMs with ongoing comments. > 0345 by an OM. Mackenzie-CA. > with an ID at 0358 as WWRB and suddenly off the air. > June 8 OM preaching about God. Mackenzie-CA. > English 333 June 8 OM with religous comments. > music. OM ancr and no ID's were heard. Mackenzie-CA. > propagation up to the 15 mHz band. > 433 June 14 YL and OM with comments. MacKenzie-CA. > ancr 0459. Then more music. MacKenzie-CA. > report by a YL. //9615 . MacKenzie-CA. > other times. //9860 Vatican State. MacKenzie-CA. > June 14 Two OMs with comments. MacKenzie-CA. > Garden of Eden at 0415. Mackenzie-CA. > Culture and Language Come Alive"
Springbok Radio is back! If you can remember what a wireless is, you probably remember Springbok Radio. If you can recall the Jet Jungle or Squad Cars jingles, this is your lucky day. Springbok Radio was one of the most beloved and successful commercial radio stations in South African history. Thanks to the Springbok Radio Preservation Society of South Africa, favourite programmes such as Squad Cars, Lux Radio Theatre, Taxi, The Epic Casebook, The Men From The Ministry, The Sounds Of Darkness, and The Creaking Door, will be heard again when the society launches its Internet radio service on July 1. The new service will operate 24 hours a day, repeating a six-hour compilation of programmes four times daily. Programming will change on a daily basis. There would also be new programming that would include popular music and variety shows, and concentrate on nostalgia. For the past 21 years the society had been collecting, restoring and archiving over 20 000 original Springbok Radio programmes. commercial radio in South Africa to supplement the SABC's existing public service English and Afrikaans networks. South Africa through a network of independent production houses. However, in the eighties the SABC ended up killing off many of these independent production houses by producing most of the programmes itself. Backing up the apartheid system's segregationist policies, no black voices were ever heard on Springbok Radio. If on the rare occasion a black character was introduced into the storyline of one of the station's hastily slapped together entertainment productions, they would be portrayed by a (poorly paid) white actor. And by the mid seventies, at the height of Separate Development, there were no black policemen or criminals in the South Africa as reflected in Squad Cars, for instance. In 1976 television was launched in South Africa and this was followed by television commercials in 1978. Commercial TV was the major factor in the demise of Springbok Radio, which closed on 31 December 1985.
broadcasting was still in its infancy in most parts of the Pacific. the entire Pacific region was KAIM-FM in Honolulu. French president and Sputnik 1 fell to earth. trans-Pacific jet services of Qantas and Canadian Pacific Airlines. features in this radio heritage documentary. Mailbox program audio also at www.rnzi.com. script along with images will be available later. serving the Pacific from Wellington, New Zealand since 1948, www.rnzi.com. Your chance to win a radio or an MP3 Player! Austria and Switzerland jointly host the European football championships this month. The two Alpine countries are popular tourist destinations - famous for their beautiful landscape. You can win a shortwave radio or an mp3 player. Good luck!